Leamington Church members are convinced that their church is special -- but each probably has a different reason. For those who live in Leamington, it is a dream come true to see an Adventist church in their town at last. For the students who travel here from the Midlands colleges and universities, Leamington is the place to meet other Adventist students. For some, Leamington's tolerant and welcoming atmosphere has drawn them back to the church when they might otherwise have drifted. 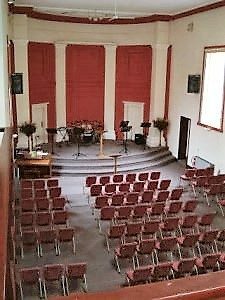 For others still, Leamington Church is where they found Christ, and a church family with whom to share their new Christian experience. For the first few years of the group's existence, we met in the magnificent Victorian chapel of the Royal Midland Counties Hospital (sadly now demolished). When that was no longer available we moved to the Sixth Form Centre of Campion School, where Philip Herbert, a church member, taught music. The search was on for a building of our own. Twice we made offers for buildings which, we told ourselves, would be ideal; twice we were outbid. The disappointment was a blow, as a great deal of work had been put in, and hopes raised. 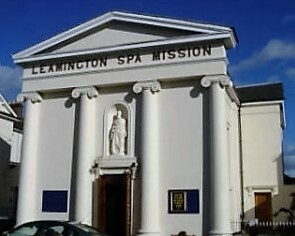 But clearly God had something better in store - for a far lower price, we bought the Leamington Mission. The Mission is a former Roman Catholic church built in 1820. 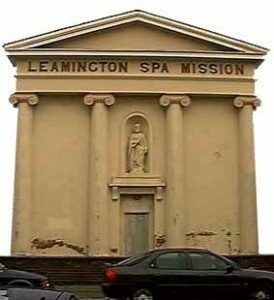 The Catholics moved to a larger building in the 1860s and it became Leamington Youth Mission (the letters are carved in foot-high letters on a beautiful facade that includes a statue of St Peter). In about 1970 the church became a social club, but had been disused since 1990. The price we paid was just £68,000 -- for a sizeable church, with several large rooms and a kitchen. Restoration cost over £100,000 more, but £40,000 came from a grant from the English Heritage to restore the outside to its former state. Church members have dug deep in their pockets, and helped by the North England Conference, (divisional Adventist church body in the UK), have paid for the building. The project is now completely debt free. The restoration involved almost the complete gutting, re-roofing and fitting out of the building. We hired professionals to do the roof and high ceiling, but everything else was done at weekends and in spare hours by a dedicated team of volunteers over the space of about 6+ years. We were helped by church members who are professional electricians, plumbers, heating engineers, but many unskilled members took part also. Time and time again during the project we have felt the hand of God guiding us and helping us - from bargain-price materials and fittings that seemed to become available to us just at the right time, to donations that arrived just in time after we ordered expensive items in faith. Not one person was injured during the project, although we were amateurs doing difficult work - and our thanks go to God for that also. From humble beginnings, the Mission at Leamington has grown from its original handful of about 18 members to well over 100 today, spanning all backgrounds and ages, with our youngest attendee being just a month old through to our oldest at an incredible 95 years of age! Such is the popularity of Leamington, it is not uncommon to find some families travelling upwards of 50 miles to attend weekly services. Whatever your stage in life, we welcome people no matter what their background. Come join us and be a part of the legacy that is the Mission, Leamington Spa! The photo far left is of The Mission on May 16, 1997 - in this picture the outside is only partially restored. The photo on the right is of the finished project. When we moved in, there was a gap between the words 'Leamington' and 'Mission'. We planned to insert the initials 'SDA' until someone pointed out that locals would assume we had mispelled 'SPA'. These two pictures (above and to the left) show the interior of the main hall of the Mission stripped out ready for the renovation work to start. Much work was needed to repair the walls, there was no ceiling and eventually the floor would also be dug up and replaced. The main hall before the balcony was built, when the baptistry was part way through construction. 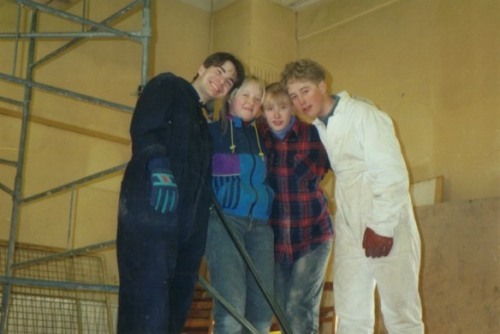 Jon, Kristina, Anna & Daniel, all devoted many weeks which helped to build the deep and long lasting relationships still alive within the church today. Terry, Alan & Rob, regular workers during the renovation, enjoy a well earned cup of tea. The new floor is laid and the balcony is almost finished. The job of sweeping up was an endless one!